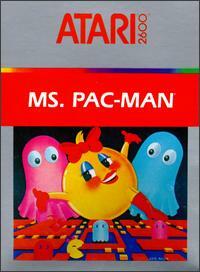 The gameplay of Ms. Pac-Man is largely identical to that of the original Pac-Man. The player earns points by eating pellets and avoiding ghosts (contact with one causes Ms. Pac-Man to lose a life). Eating an energizer (or "power pellet") causes the ghosts to turn blue, allowing them to be eaten for extra points. Bonus fruits can be eaten for increasing point values, twice per round. As the rounds increase, the speed increases, and energizers generally lessen the extent of the ghosts' vulnerability, eventually stopping altogether. The sound effects and music are very different from those of the original game, including a new opening theme and "death" sound effect. As with Pac-Man, this game has a bug in the subroutine that draws the fruit, which renders the 256th round unplayable. However, the game also has other bugs that cause it to crash or become unplayable much sooner, making it impossible to reach Round 256 without the use of emulation. In 2009, Game Informer put Ms. Pac-Man 10th on their list of "The Top 200 Games of All Time", saying that it "trumped [the original Pac-Man] in nearly every way". This is down one rank from Game Informer's previous best games of all time list.